John Perry T.D. was appointed Minister of State with responsibility for Small Business at the Department of Enterprise, Jobs and Innovation in March 2011. John, a full-time Public Representative, was first elected to the Dáil in 1997 representing Sligo/North Leitrim and was spokesperson on Science, Technology, Small Business & Enterprise and the Border Counties from 1997–2002. He then served as spokesperson on the Marine 2004–2007. In the 29th Dáil he was Vice-Chairman of the Oireachtas Joint Committee on Communications and Natural Resources and was a member of the Audit Committee of the Houses of the Oireachtas Commission. From September 2002 to October 2004 he was Chairman of the Public Accounts Committee. On his re-election to the Dáil in 2007 John served as spokesperson on Small Business. He was re-elected to the 31st Dáil in February 2011. Elizaveta Donnery is a partner in Donnery Tierney Solicitors. Elizaveta qualified as a lawyer in Ireland and in Russia — she is the only person in Ireland with qualifications from, and experience in, both jurisdictions. She is experienced in both general practice and commercial law in Ireland. In Ireland she worked in general practices on litigation, immigration, and property cases. She also worked in one of the leading Irish commercial law firms. She has experience in acting for various commercial and private clients. Elizaveta holds a Law Society of Ireland Diploma in Finance Law. She is fluent in Russian and is experienced in complex legal translations. Ann McGee B.Sc. (Pharm), M.Sc., MPSI is the Managing Director and Principal Consultant with McGee Pharma International, providing quality, regulatory compliance and training services and products to the pharmaceutical industry worldwide. Ann is a member of the Committee of the Irish Chapter of the Parenteral Drug Association (PDA) and of the European QP Association Expert Panel on GDP. Consultancy was a natural progression for Ann with 22 years experience working within the pharmaceutical industry and as a Regulator. One of Ann’s previous roles has been as a Senior Inspector with the Irish Medicines Board. In this role Ann inspected in the USA on behalf of the European Medicines Evaluation Agency (EMEA) and the centralised procedure for the approval of medicines for European markets. Ann has also held the position of Registrar (CEO) with the Pharmaceutical Society of Ireland. In her career as a Regulator, Ann was actively involved in the development of legislation and best practice standards and guidelines for the broad pharmaceutical industry. Between 1983 and 1993, Ann worked as a pharmacist and held various positions in the Pharmaceutical Industry in the areas of Product Development, Clinical Trials, Regulatory Affairs, Technical Management, Quality and Compliance. Ann was announced as the Enterprise Ireland WMB Female Entrepreneur of the Year 2012. McGee Pharma International received a Highly Commended Award in the Services Category of the Small Firms Association National Business Awards 2012. Previous awards include Highly Commended Outstanding Small Business at the Small Firms Association National Business Awards 2011, Best Small Business 2011 at the Fingal Chamber Awards and winner of the Fingal County Enterprise Board Entrepreneur Award 2009. John Brophy was approaching his 50th birthday when after 11 years working at a senior level in IT management in a major multinational, he was unexpectedly made redundant. This was exactly what John needed to turn the idea of becoming an entrepreneur into a reality. John decided to invest his entire redundancy payment into setting up Carrig Solutions. Carrig Solutions provides IT infrastructure support to blue-chip companies all over Ireland and the U.K. The company is constantly recruiting and building its team. John has just hired his 8th full time employee and also has two part time employees. The combination of John’s 30 years IT expertise and excellent service delivery has enabled the company to make its mark from the outset. John is grateful for the support he received from Wicklow County Enterprise Board at an early stage. 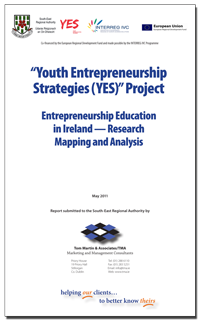 In 2011, the TMA team of Tom Martin, Dermot O’Doherty and Jim McDevitt who have extensive experience of innovation and SME policy analysis, collaborated with Professor Thomas Cooney of DIT in carrying out a study of entrepreneurship education in Ireland. The study which was commissioned by the South East Regional Authority mapped the provision of entrepreneurship education at primary, secondary and tertiary education. The Executive Summary of the report can be downloaded from the SERA web site.